Preheat oven to 425°F. 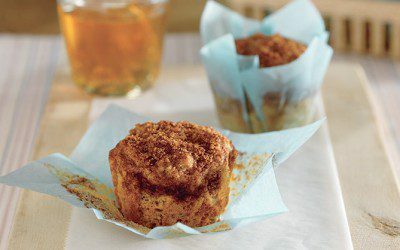 Spray 12 standard (2 1/2-inch) muffin cups with nonstick cooking spray. Combine 2 tablespoons brown sugar and 1 teaspoon cinnamon in small bowl; mix well. Set aside. Combine flour, baking powder, remaining 1 teaspoon cinnamon, salt, baking soda and allspice in large bowl. Stir in remaining 1/3 cup brown sugar. Combine sweet potatoes, buttermilk, oil and egg in medium bowl; mix well. Stir into flour mixture just until moistened. Spoon evenly into prepared muffin cups. Sprinkle with brown-sugar cinnamon mixture. Bake 14 to 16 minutes or until toothpick inserted into centers comes out clean. Remove to wire rack; cool completely. Exchanges per serving: 1 1/2 Bread/Starch, 1 Fat.